Posted in: BSU Journal Club. 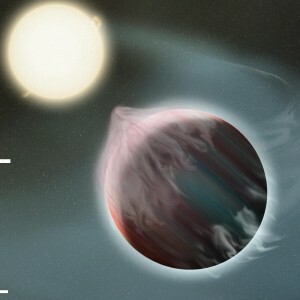 Tagged: astronomy, close-in exoplanets. At journal club today, we discussed a recent paper by Valsecchi et al. (2015) that looks at mass loss from hot Jupiters. These planets are so close to their host stars that the stars can blast away and rip the planets’ atmospheres apart. By employing the sophisticated star/planet evolution model MESA, Valsecchi and colleagues found that the planets can shed most of their atmospheres, leaving behind a small sub-Neptune planet in a short period orbit. However, gravitational interactions between the planet and escaping gas actually push the planet away from the star as the planet is shedding mass, potentially out to orbital periods of a few days. The upshot of this is that, based on these calculations, the recently discovered population of small ultra-short period planets probably did NOT originate from atmospheric stripping of more massive planets. So it’s not totally clear how these little planets originated, although Kevin Schlaufman suggested one still viable possibility. Today’s attendees included Jennifer Briggs, Emily Jensen, Charlie Matthews, Jacob Sabin, and Tyler Wade.